Crippled by injuries to a few key players including sophomore forwards James Adams and Sam Irvine, along with senior goaltender Steve Estep, the St. Paul Academy and Summit School/Mounds Park Academy hockey squad had to battle to defeat an aggressive Prairie Centre team 4-2 on Thursday evening at Drake Arena. After a sluggish first two and a half periods, the Academy boys came alive after two crushing body checks, one by junior wing Johnny Tocho, and the other by senior captain Jacob Rice, scoring three unanswered goals after Prairie Centre broke a 1-1 tie at 1:31 of the third period. Senior captain Mike Falvey took a pass from sophomore defenseman Max Hommeyer, weaved through three North Star defenders and beat goalie Marcus Tomsche with a nice move to his backhand to tie the game at two with just under ten minutes remaining in the game. 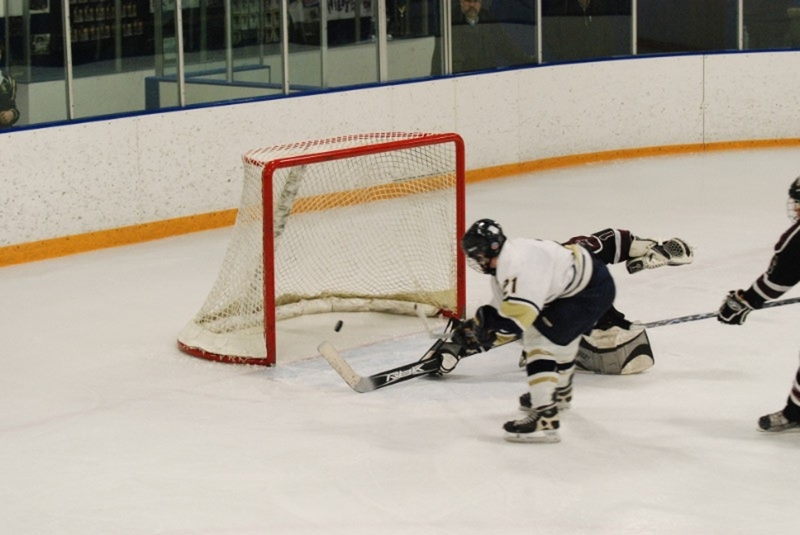 Next it was another senior, winger James Wood, who made a nice play to give the Spartans the lead, tipping junior defenseman Sam Rock's shot from the point, scoring what would prove to be the winning goal (Wood has three game winning goals this season). Junior wing Wyatt Wenzel gave the Spartans a little breathing room, sending home a power play goal with just over four minutes remaining. Junior Pete Simpson filled in for Estep in nets, making several acrobatic saves en route to an 18 stop victory, moving his record to four wins and one loss on the season. Next up for the Spartans is a makeup game against the ninth ranked Marshall School of Duluth. The puck drops at 3:30PM Saturday at Mars Lakeview Arena in Duluth. The Spartan road doesn't get any easier next week, as the Academy welcomes fourth ranked conference rival Breck to Drake Arena on Tuesday evening.